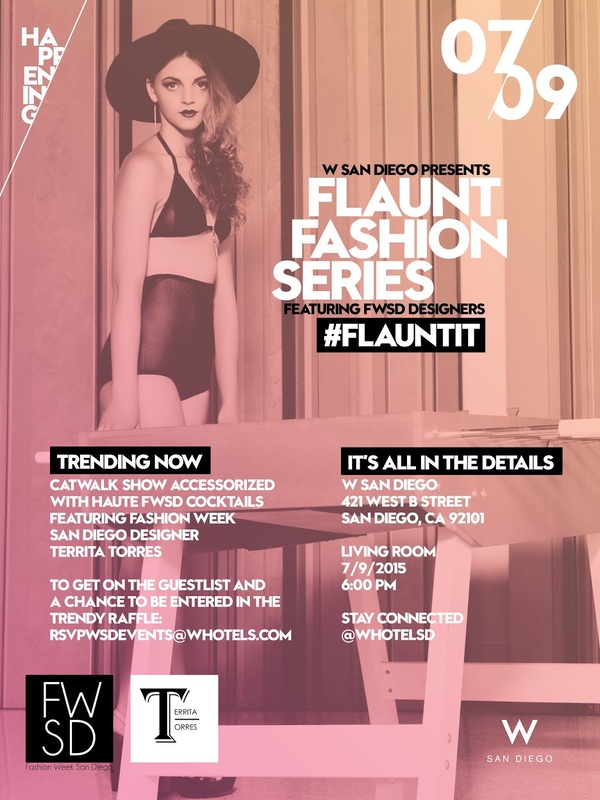 Fashion Week San Diego will be presenting an exclusive runway show at The W Hotel San Diego as a part of their Flaunt Fashion Series tomorrow night. The featured FWSD designer will be Territa Torres! The W’s Living Room Lounge sets the perfect sophisticated and intimate ambiance for our Flaunt Fashion Series event. Featuring an exclusive runway show and signature cocktails, Territa Torres’s unique and innovative womenswear designs will light up the catwalk. "The W’s Living Room Lounge sets the perfect sophisticated and intimate ambiance for our Flaunt Fashion Series event. Featuring an exclusive runway show and signature cocktails, Territa Torres’s unique and innovative womenswear designs will light up the catwalk. Nespresso will also be joining us this evening to hand out samples, and give away a Nespresso machine valued at $400+! From now until Thursday [July 9th] at 7pm, anyone who purchases FWSD15 October Runway Passes will automatically be entered to win. Winner will be selected at 7pm during the Flaunt Fashion Show. (You don’t have to be present to win, although, we would love to have you there!)"